my job is easy so you'd think i wouldnt care about coming home. i fight crime on the mean streets of los angeles. good part is, all of us went to college and hardly any of them did. also we have the technology, the experience, the team work. lots of former agents and guys from all over are part of the new company that i work for. some have described it as fbi freelancers. basically, if the agency doesnt want to do a portion of an investigation, or they cant, or they have to do something super dirty, they outsource it to us. they dont pay us, but we get to keep whatever we get as long as its not evidence. 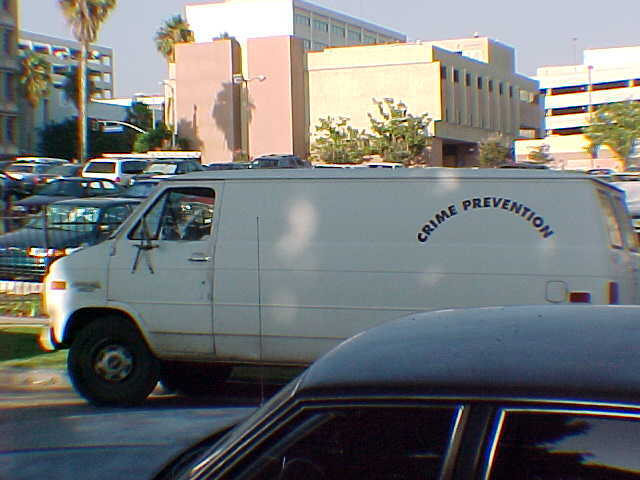 the bad guys are so dumb that me and my partner drive around in that van and still no one thinks that we're doing what we're doing. it's almost like reverse psychology. of something. but when the day is done, i park the van near the church and come home and get my mail. then i fix myself a drink. lately it's been margueritas. then i snort a rail of cocaine. then i shoot up some h. then i smoke a cigarrete. and then im ready for some network television. who call and knock and bring over brownies. and it's still the summertime.